playing seven nights a week at any one of the three locations of Fitzgeralds, the regions favorite irish pub and restaurant. Diners and drinkers alike love the spirited, energetic and joyous music from the american folk trio, a mixture of bluegrass, country, folk and irish music, with some rock, rockabilly and pop classics thrown in to the eclectic mix. Louis Salvatore, the fearless and friendly leader of the band, who will have you singing and clapping along before you even know he's there. He has decades of musical experience in Southwest Florida and shines as the trios' leader, as well as playing guitar, fiddle and bass with the band. Linda Kallinger, with her sweet and lovely voice, dazzling fiddling and charming disposition, has been playing bluegrass, country and irish music in the area for many years, and is a local and regional favorite. Joe Marino, a showman in his own right, has been a tribute artist in the Naples area for years, with dead-on stylings of Elvis, Johnny Cash, Marty Robbins and many other country, pop and rock legends. He and his band, "All the Kings Men" have been delighting audiences for years with a dazzling stage show. To supplement the core band, when someone has other obligations, is an array of great, fun local musicians. Steve Rosen on mandolin and harmony singing, spends the winter in SWFL playing music and spends the rest of the year playing and teaching music in chicago. Scott Ritter, another local acoustic music legend, plays guitar and mandolin and is in constant demand by all the local bluegrass bands. Leslie Weidenhammer is in several local bluegrass bands as a bass and mandolin player and her powerful vocals. Roli Scholl is a lightning-fast fingered dobro, mandolin and guitar player with his own local band. 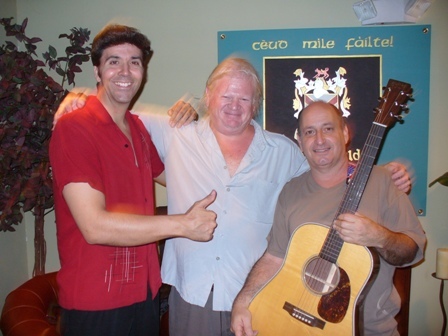 Billy has a rich local history as a rocker and plays mandolin and guitar with the trio.